2015: The year of Mastery! The topic for 2015 is mastery! = number 8. Last year, a 7, was a string of tests and challenges presented by Saturn as it proceeded through Scorpio focusing on the ‘nitty gritty’. What is revealed is the bare bones of the individual self; what is driving us home at this time. Whatever is the next step in the unfolding, we do that with mastery! 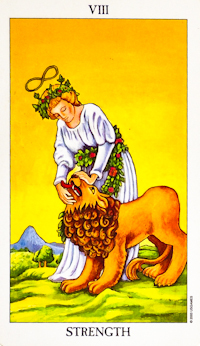 The 8th major arcana card of the tarot deck is Strength. It exudes calm confidence as many tests have already been successfully completed. The taming of the beast puts one in a place of no longer being controlled by the ’ego’, free to create in the moment unencumbered by patterns based on the past. The clearest representation of this symbol is found in the classic Rider-Waite deck. The card is a simple illustration of the mastery of an aspect of human nature requiring integration and balancing in a non forceful way. Saturn moved into Sagittarius on the 23rd of December! We are on the way to disciplined but bold and determined expression of truth, wisdom and authenticity! However, considering the often unyielding nature of Saturn we should be prepared also for the continued assertion of beliefs that still motivate various cultures and organizations. In Sagittarius is a surety that can promote radical behaviour for the sake of the cause. 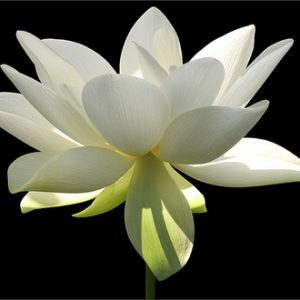 Mastery of self that leads to awareness of Self and the subsequent dissipation of suffering. Mindfulness that we create with clarity and re-engaging the power of discernment so that the individual is freed to make decisions that serve the highest good. Though this is the year of the ‘sheep’ we will not be led. We are talking about the ferocity and determination of the mountain goat, the big horned sheep that perch confidently on even the narrowest ledge. Successful in business and community cohesiveness. If you choose confrontation you will find your self butting heads with the wind. Therefore establish no mind, aikido mind and dance with the Self. The topic for 2015 is Love—there is nothing else—and you as an individual expression of that, nothing more, nothing less. What we ‘do’ with that expression is the most natural thing possible. It is not possible to not be a natural expression of that. To say that I seek to know my ‘true’ self is impossible. This is it, in this moment now. As Richard Sylvester says, “We want what is with a cherry on top.” The cherry is a representation of the ego exerting itself. It is a complete redundancy. I know this to be everything but I want more? In the meantime we traverse the moment on our way to realization of this Truth and the glorious sense of freedom resulting from knowing there is nothing that I need do to make anything happen. We stop suffering. In suffering, I am something. In understanding, I am nothing. So what are we doing here? Knowing liberation, savoring every step toward complete liberation. Every time ‘I act’ in authenticity and awareness “I’ experience freedom. Realizing it adds to this sense until there is no awareness of any difference between anything and another thing. It is aware, awake and love. Do we continue to create a story here? Yes, until we are no longer dependent upon that story. What is it about 2015 that might seemingly further us in awakening to seamless existence? The ability to master the chaos or illusion is strong this year. Each individual has the potential to step out of self judgment and insecurity to fully embrace the gifts and talents that most serve this individual and in turn the collective. Effective leadership and conscious interaction determine a more balanced and peaceful way of engaging here. We will see that nothing stands still and that therefore there is nothing to which we can attach our selves or that whatever we are attached to has little meaning in the evolving landscape. The recognition that really, nothing has meaning is a beautiful introduction to a road less traveled perhaps, but none the less one that has called to all of us throughout our experience here. When it is the only call one hears we add our footprints to those who eventually gain great clarity and the opportunity to reflect this light to others. 2015 is therefore, also a call to those who teeter on the edge of this Reality; to gather the light and dispel the chaos. 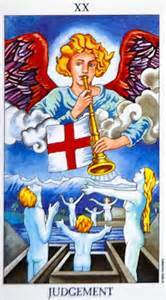 The major arcana card that depicts this notion is the 20th card Judgment. The souls rising from the coffin have heard the angelic trumpets sounded and once this has occurred there is no turning back. The rhythm that is our essence is felt increasingly, impelling us to deeper and deeper realization that happens now as the natural outcome of deleting all ‘clothing’ from days, weeks, years and centuries gone by. There is a moment of rejoicing as one comes into head on collision with that which we have most desired—liberation from the illusion—we have awoken! Every year is a grand year in which to experience illumination. 2015 however has the highly advantageous position of following upon all that has been accomplished before. In love, mastery and wisdom greet the sunrise of this day! And blessings for inner peace. The angel for 2015 is Araquiel: master of earth. The elements are fire and ice. The turning point February 8th.